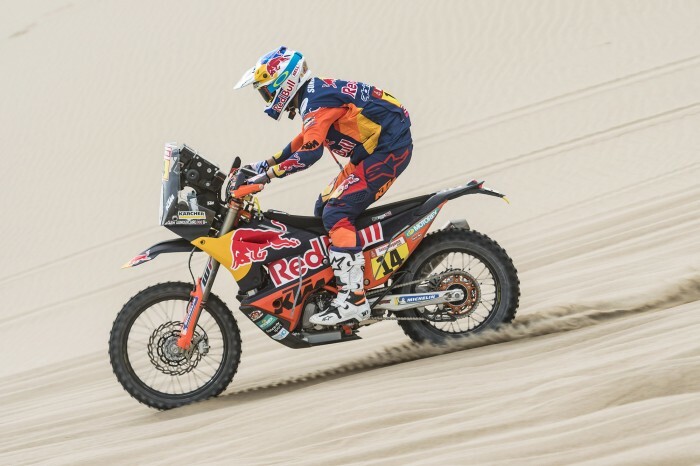 Reigning Dakar bike champion Matthias Walkner (Red Bull KTM Factory Team) fought back brilliantly to win the second stage from Ricky Brabec (Monster Energy Honda Team 2019) yesterday. The American was the fastest rider to the first 50km mark with Walkner cutting the gap to just one second after 100km. Brabec pulled clear again, only for the Austrian to roar back to win by 22 seconds with third-placed Joan Barreda (Monster Energy Honda Team 2019) retaining his overall lead by 1’31. “The cars were difficult to pass in places, but the most difficult was the fesh-fesh (fine sand) getting really loose. Sometimes with the bikes it was so deep that you can’t miss some stones, so it was quite dangerous but fun,” said Walkner. Following his victory yesterday, Walkner will have to open the way on the route to Arequipa. The 2018 winner is perfectly capable of carrying out such a mission, but it is very likely that he will have to do battle again with the Honda’s of Ricky Brabec and Joan Barreda, both in very good form unless Adrien Van Beveren goes on all out attack to make up for two disappointing days so far. Britain’s Sam Sunderland rode another calculated stage, minimising any risks on the heavily worn terrain. 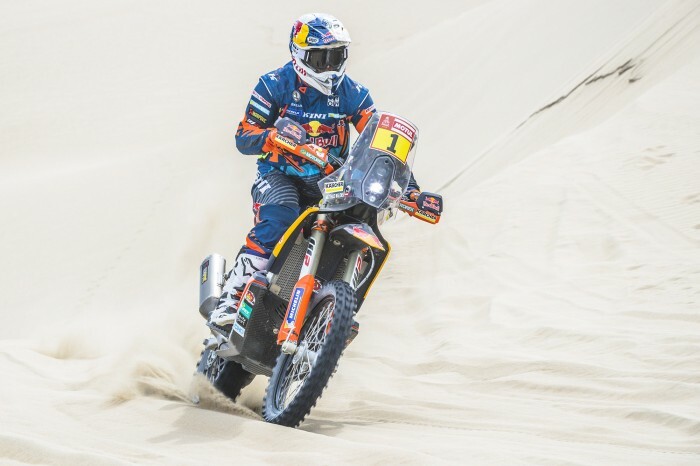 Although not quite finding his rhythm on the long timed special, the Brit is still confident that his pace is good and is feeling fit and motivated for the rest of the event. “It was a pretty tricky stage covering the car lines. You are always cross-checking the road book to make sure you’re not making any mistakes. I didn’t find my rhythm as well as I would have liked, I know my pace wasn’t too bad but I didn’t feel so strong out there,” he said.